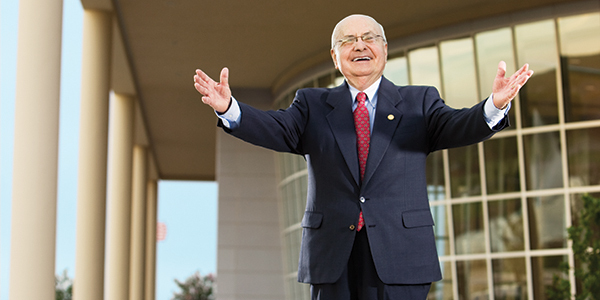 The ACU building bearing his name – Hunter Welcome Center – befits Bob’s character and welcoming demeanor as an Abilene Christian University icon. Most people call him Bob. In formal settings, he’s Dr. Robert D. Hunter (’52), but for most folks associated with ACU, he’s simply and affectionately known as Bob. For a very specific group, though, he’s something more: He’s known as the founder and creator of one of ACU’s most colorful traditions. He’s the father of Sing Song. “He’s a visionary,” said Nick Tatum (’13), four-time class Sing Song director, who as a student never knew Bob, although he refers to him as Dr. Hunter. But Tatum knows well what he created. Hunter returned to ACU with plenty of ideas for how to promote and grow his alma mater. After graduation and service in the U.S. Navy, ACU president Dr. Don H. Morris (’24) asked Bob to coordinate an alumni event in Washington, D.C., and he did – with gusto. Bob did such a great job that Morris told him he had to come work at ACU as a special events director. Bob’s plan was to return to California to be in business with family members, but Morris pulled out a carrot. “He convinced me by telling me if I came back, I could start a Sing Song AND a Homecoming Musical,” Bob recalled. So Bob returned to ACU in Fall 1956, and by February 1957, ACU experienced its first Sing Song. To assure Morris that students wouldn’t get away with “anything they wanted” in the show, Bob asked former classmate Dr. William J. Teague (’52) who was then working as ACU’s assistant to the president, to serve as emcee for the show. They also realized they needed categories for competition, he said. The men’s and women’s divisions appeared the second year, and the mixed-voice division was added the third year. As the learning curve flattened, Sing Song was on its way to being one of the jewels in ACU’s crown of traditions. 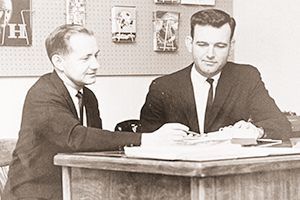 Hunter (left) and William Johnson helped lead the Alumni Office in its early years. Johnson took over for Hunter as the director for Sing Song in 1963. The show began in Sewell Auditorium – sporting a hyphen in its name as Sing-Song – and continued there a few years, but space was an issue. In 1963, Sing Song moved to the Abilene High School auditorium to accommodate a larger crowd. 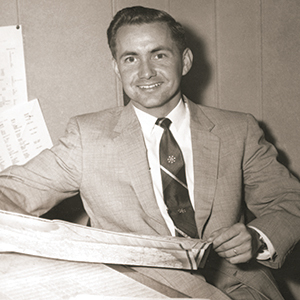 That same year Bob relinquished the reins as show director to William Johnson (’53), then in 1964 Dr. Gary McCaleb (’64) took the mantle as show director. “Bob Hunter was the catalyst,” Tatum said. “His dream of creating a competition has unified ACU students around the bonding power of music.” Tatum saw this first-hand as a class director who won all four years with no ties. In Sing Song lore, that’s been dubbed a clean sweep. It’s only happened three times in our history. The other two directors who accomplished that were Matt Moreland (’98) and Bob’s son, Les Hunter (’86).